Tribes Overall: "Having 4 locations over 2 weeks was great and allowed us to pace the holiday well. Self drive was easy so the car rental gave us good flexibility. " Tribes Service: "Some useful ideas on locations and pace, spreading our activities throughout the trip." Guides: "Great knowledge, good English usually. They understood our requirements and made each activity fun." Social & Environmental Responsibility: "We definitely understood that our tourist money was helping protect the wildlife and rainforests. In showing an interest in sustainability we encouraged local concern for the same. " This was a good stop over from the flight. It felt too far from town to walk/see San José so we had a gap on Sat afternoon. 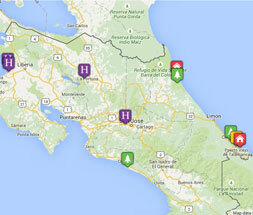 However, it was an easy drive out on Sunday with our rental car as we got used to Costa Rica roads and signs. The food and service were lovely. Lovely location and cabins.... HOWEVER, their appproach to service from reception to the restaurant was not up to scratch. We arrived at 2pm to find only 2 cabins available- one next to the pool generator, and one next to reception. Neither with volcano views. We asked to move and they said “maybe tomorrow”. The local rep sorted and we moved for definite the next day to one of the best cabins. This same ‘don’t care’ attitude was everywhere. This really undermined a quality location and infrastructure. Good sized room and great location near 2 National Parks. Restaurant was a little expensive, but the town was local enough for us to find other good options. Staff very friendly and helpful, especially as our car needed replacing here. "1) using local guides to point out interesting wildlife - birds, insects, plants, monkeys etc. 2) staff in hotels going the extra mile in providing ideas for local sights, bars, and also to provide a vegetarian menu 3) confidence of knowing that hotels were booked and we had Tribes backing to ensure we’d get excellent service. 4) hotel Borinquen felt out of the way but is a little haven - natural hot spring sauna, mud bath, hot pools to relax and a rodeo horseback ride to the waterfalls to re-energise. Definitely use again. "